I am so excited!!! I bought my first watermelon this week. 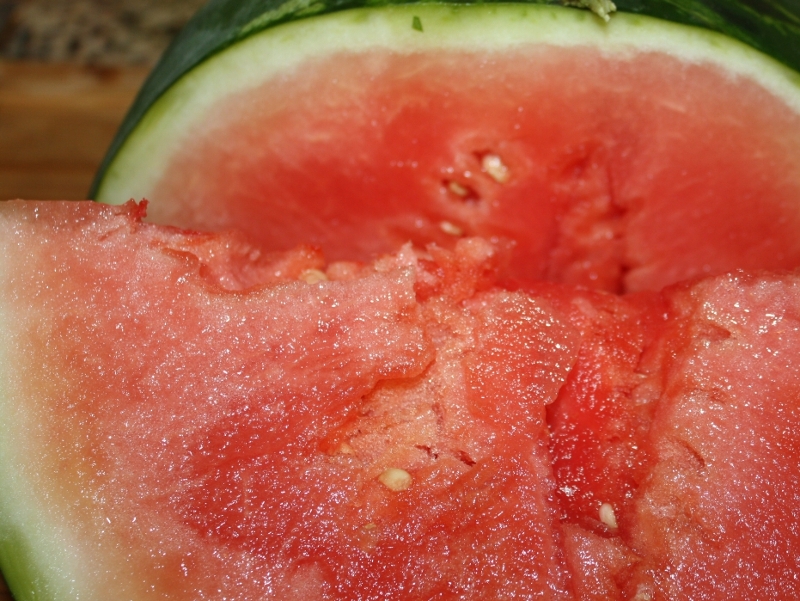 I’m a watermelon purist so I eat most of my watermelon straight off the rind. Being first watermelon of the season, unfortunately, this one wasn’t very sweet. My mom has always puts salt on her watermelon and I have always thought it was weird…until today. Not wanting to waste any of this fun summer fruit, I took to the internet. Watermelon sorbet – nah, still have mango in the freezer. Watermelon margarita…hmm, it’s noon. Watermelon soup – that just sounds wrong. 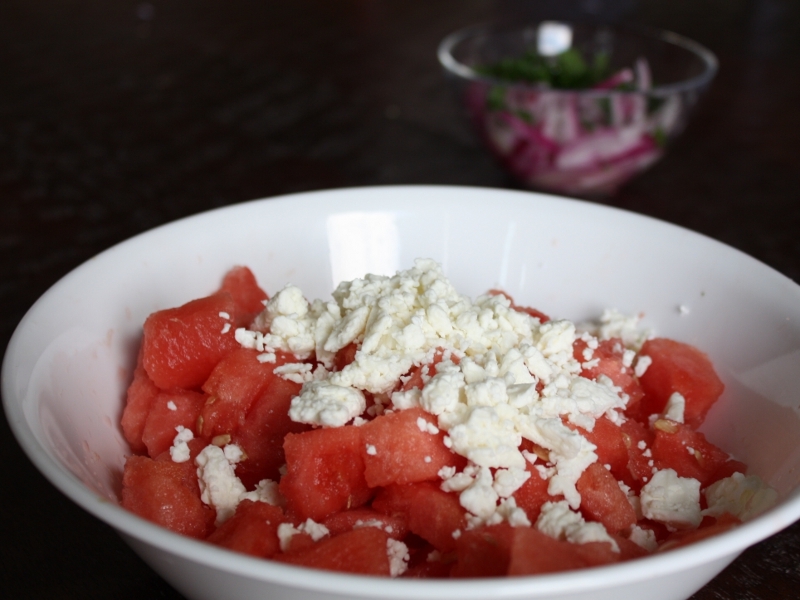 Watermelon salad…ah salad, that sounds refreshing. My mom has always puts salt on her watermelon and I have always thought it was weird…until today. After a little looking, Simply Recipes had a couple of recipes that caught my attention. Feta cheese, red onion, mint and parsley – this recipe definitely shows me the appeal of salt and watermelon! 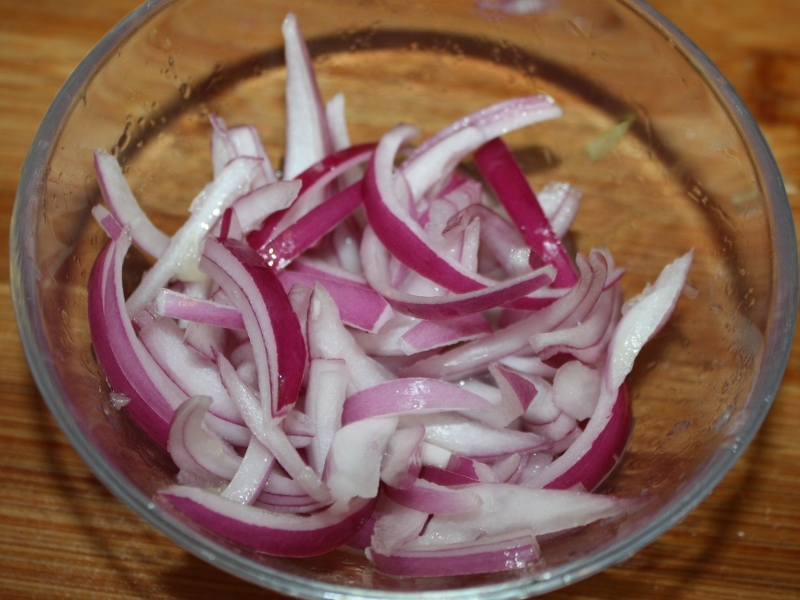 Place sliced red onion, lemon and lime juice into a small bowl. Allow onions to sit while preparing the rest of the salad. Cut watermelon into 1” cubes. Cut the handful of mint and parsley into tiny pieces. 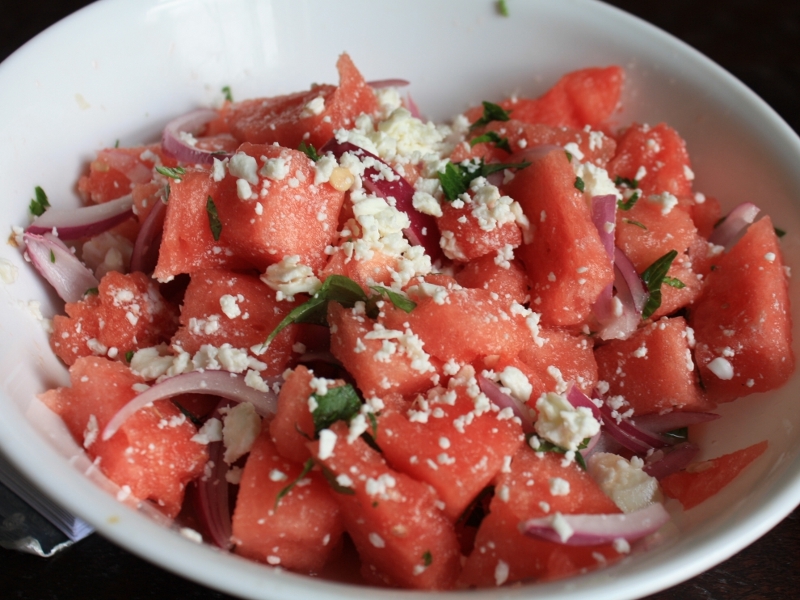 Combine watermelon, red onion, feta cheese, mint and parsley into a medium sized serving bowl. Carefully stir until fully mixed. Allow salad to chill for 30 minutes before serving so the flavors can meld. But be sure to finish it the same day it’s made because the watermelon will get soggy. I’m going to have to try that recipe! I made a grilled watermelon salad the other day from 5 Ingredient Fix (http://www.foodnetwork.com/recipes/claire-robinson/grilled-watermelon-salad-recipe/index.html). 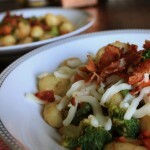 The balsamic vinegar reduction was a great addition. MMMMMMMMM-HMMMMMMM!! Probably what the hostess did with the lvfoteers (if there were any) from the huge watermelon-carved-into-a-bowl and filled with melon balls (three kinds) and berries and pineapple and strawberries.It was immense, and when we arrived and set it down on the platter, she took TWO bottles of ice-cold rum out of the freezer and dumped them in, all over the fruit.I didn’t stay for the party, but I’ll bet there WAS one. 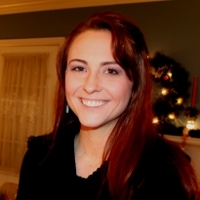 She probably coulda blender-whizzed the whole shebang—rind and all, and they’d have drunk it right down. Deadly auccrtae answer. You’ve hit the bullseye!